Our 11th Annual Fall Fire Festival was held on November 3, 2018. Thank you to the community for supporting our event and mission! THANK YOU to our event sponsors and participating food trucks! Missouri Arts Council, City of University City, Schlafly, Urban Chestnut, Smoke & Mirrors, Sullivan Farms, 2Girls4Wheels Food Truck, Bridge Bread Food Truck. Thank you to everyone that made our Cocktail Doodle Doo Fundraiser a success on September 29, 2018! Celebrating 20 Years of The Green Center! Spector Family Nature Room now open! On Sunday, October 15th, we were excited to officially open and dedicate The Spector Family Nature Room, the latest step forward for The Green Center in our commitment to make nature education available to all. Named in honor of beloved former board members Jerry and Judy Spector, the Nature Room is a fully ADA-compliant space for outdoor and indoor enrichment programs that will allow us to host more programs for (especially) children, seniors, and veterans. Jerry Spector first joined the Board of The Green Center in 2011, and after pouring so much of his last years into its community and mission, saw that torch taken up by his sister Judy after he passed. Judy Spector spearheaded the renovation of the garage of The Green Center’s 1932-built structure, wanting to see it become a first-rate nature education center named for her brother, Jerry. The Spector Family came together in spectacular fashion after Judy’s illness claimed her last year to put the project over the top. It is named for both of these wonderfully committed lovers of nature and the community—and our friends—Jerry and Judy Spector. Come visit the space and join us for any of our nature, arts, and conservation events this Fall. We have always wanted to bring the wonders of the natural world to our neighbors, and The Spector Family Nature Room has allowed us to bring more of our neighbors into nature. Our 10th Annual Fall Fire Festival was held on November 4, 2017. Thank you to the community for supporting our event and mission! Thank you to everyone that attended our 2nd Annual Happy Hen Hoedown on September 23, 2017! For the past 26 years, caravans of little yellow school buses have been traveling throughout the US every summer. Beginning late June, the buses travel to 75-100 events making stops in various cities from coast to coast. Each caravan bus will have a number of people onboard, the “Caravanistas”, along with donated supplies and equipment all headed to Cuba. The Green Center will host the St. Louis Cuba Caravan event at its center in University City located at 8025 Blackberry Ave., Wed. July 8. The public is invited to join the Green Center in welcoming the Caravanistas. A Taste of Cuban Food by board member Chef Scott Shippey will be offered in our “pop-up” Cuban café or paladares as they are called in Cuba, the family run house restaurants in Cuba’s local neighborhoods. Small donations are welcome. Exhibition of Old Vintage Cars The “Just Us Car Club” will have a number of old cars on the grounds of the Center, in recognition of the many old cars from the 40’s & 50’s that Cubans are known for keeping on the road. Craft Table for children and adults Learn about Cuban children’s artwork and activities. Make a friendship card to send on the Caravan school bus for our neighbors in Cuba. 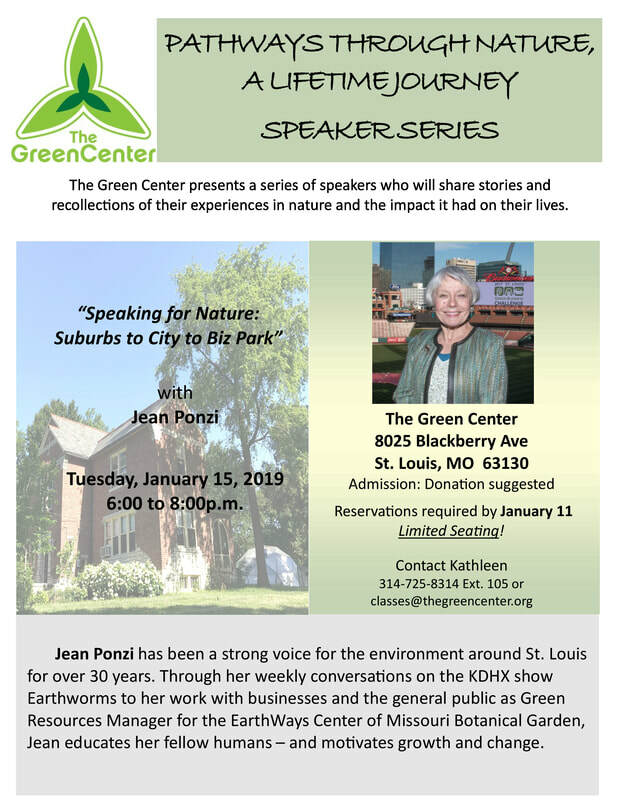 The Green Center will share about the work of the Center. Visit our Global Roots, Local Shoots Diversity Garden. The Green Center has a STL250 Cake! We have been caked! Come visit us to view our Cakeway to the West special cake to celebrate St. Louis' 250th birthday! Update: Thank you to everyone who visited The Green Center in search of our cake! As of January 21, 2015, the cake has been moved to a new location. “I found a unicorn tail!” shouts a little girl with a long braid, as she sprints through a garden clasping a feather. She’s tracking down elements to build a 3-D animal. Her headquarters? The Green Center (8025 Blackberry, 314-725-8314, thegreencenter.org). Our passion is connecting kids to nature, but incorporating science and the arts,” Streett explains. When gourds are in season, campers pluck them from the stem to carve and paint. In another camp, kids make scent sacks out of herbs picked fresh from the garden. Oregano, with its pizza scent, is the crowd’s favorite. Streett opens a white trash bag. “Oh, I see we’ve got sweet flag in here,” she says, also pointing out fluff from a milkweed pod. Then the students travel to a neighboring wooded area to get a variety of materials for building fairy houses. “This is a very different way for them to use their brains than they’re used to,” Streett says. The Green Center welcomes participants in the International Visitor Leadership Program! We had a group from the International Visitor Leadership Program visit our Center! Countries represented include Ethiopia, Finland, Mexico, Nepal, Pakistan, People's Republic of China and Tunisia. The Healthy Planet features P. Allen Smith and a member of The Green Center! Our very own Golden Laced Polish chicken named Alberta visiting P. Allen Smith! The Healthy Planet highlighted this visit in their June 2012 magazine that you can view here. Richard Louv, author of "Last Child in the Woods: Saving Our Children from Nature Deficit Disorder" visited The Green Center on May 1st! Check out the stlmag.com article about Backdoor Harvest's bee hives at The Green Center. The bee hives are located in Kaufman Woods which is behind the headquarters of the Center. The bees can be found daily around the hives and buzzing around all of our gardens! The Green Center Receives Award! The Green Center received this year's Top Ladies of Distinction, Inc Area III Community Service Award for "Outstanding Contributions to Community Beautification." A special thanks to the Top Ladies for granting us this award at their 35th Annual Leadership Conference held on March 11 and both the Top Ladies and Top Teens that help us with our restoration events each year! 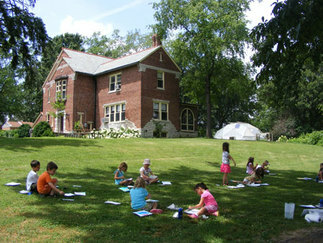 The Green Center is excited to announce receipt of a grant from Kresge Arts in St. Louis to support arts integration. This award will fund a key component of the Center's Green Jobs training program, aesthetic documentation. This form of ecological monitoring engages participants in the visual and literary arts by utilizing these in the process of data collection. Kresge Arts in St. Louis is a partnership of the Kresge Foundation, the Arts and Education Council, and the Greater Saint Louis Community Foundation. Calvary Cemetery Prairie Restoration Project Featured in the April 8 "The Economist" Magazine! The Green Center has partnered with the Missouri Department of Conservation, Missouri Botanical Garden, The Nature Conservancy, and the Archdiocese of St. Louis Catholic Cemeteries to preserve and restore the last known native tallgrass prairie remnant in St. Louis, located at Calvary Cemetery. As part of this collaborative, The Green Center has coordinated outreach efforts, volunteer planting and invasive species removal days, and hands-on education in the Calvary Prairie. You can also read more online at the The Economist.